Dinner Is Coming To An End…Or Is It? I’m sure you’ve all heard by now that NBC has made the worst mistake of it’s existence. They have decided that as brilliant as Hannibal is, they’d rather not continue with it. I’ll never understand why companies do this. You’ve got a critically acclaimed show with brilliant actors and a great plot and you decide “Whatever let’s trash it while the getting is good”?! It’s almost as if they want to lose viewers. Well, I thought that all hope was lost. Yet another amazing show that got the ax for no reason…until I saw that support from other Fannibals like myself. Carlos Mazal form Uruguay has created on online petition on change.org to save the show. It’s actually received over 67,000 signatures and need 75,000! It’s been mentioned all over twitter with #SaveHannibal. So please be a gem and sign the petition. 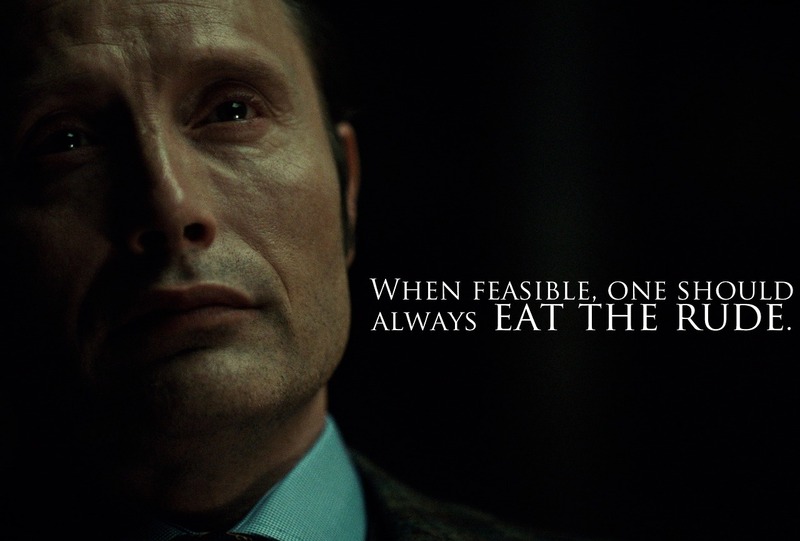 I’m sure Hannibal won’t make you part of his main course if you do. Not only are the Fannibals fighting to keep the show but Brian Fuller, the show’s creator, is hopeful that Hannibal will be picked up for another season elsewhere. Can we say Netflix or Amazon? Nothing is set in stone yet but we all need to keep our fingers crossed and hope that we can save this deliciously gory show from the copping block. I really don’t want this dinner party to end. Check below to sign the petition! I’m confident that the show will be picked up elsewhere, regardless of petition, but I’ll check it out. Unfortunately, it doesn’t matter if a show is actually good to determine its merits on network TV. It’s always about the ratings. If not enough people are tuning in during the show, it’s not economically viable to keep it on air. That’s just the way it crumbles. Arrested Development was an amazing sitcom, but Fox didn’t adequately market it. In turn, the ratings suffered, and it got pulled before it could reach its full potential. Network TV isn’t the place for Hannibal, though. The structure and pacing, as well as the gratuitous violence would fit in perfectly on a streaming service. I think the right people know it, and I’ll think we’ll hear more about it soon.